Pick up a copy of Songlines Magazine (Jan/Feb 2013) in WH Smiths from 7 December and there will be a free Route book attached to it. Either The Train of Ice and Fire or Away From the Light of Day. Here’s a little information on the books and a few film clips. Colombia, November 1993: a reconstructed old passenger train, bespangled with yellow butterflies, is carrying one hundred musicians, acrobats and artists on a daring adventure through the heart of a country soaked in violence. The intention is to put on free shows for locals at railway stations along the way: vibrant spectacles involving music, trapeze, tattoo-art, an ice museum and, star of the show, Roberto the fire-breathing dragon. Leading this crusade of hope is Manu Chao with his band Mano Negra. Ramón Chao is on board to chronicle the journey. As the train climbs 1,000 kilometres from Santa Marta on the Caribbean Coast to Bogota in the Altiplano, Ramon keeps one eye on the fluctuating morale of the train’s eccentric cargo, and the other on the ever-changing physical and social landscape. As the papa of the train, he endures personal discomfort, internal strife, derailments, stowaways, disease, guerrillas and paramilitaries. When the train arrives in Aracataca, the real-life Macondo of One Hundred Years of Solitude, Mano Negra disintegrates, leaving Manu to pick up the pieces with those determined to see this once-in-a-lifetime adventure through to the end. The Train of Ice and Fire is a book about hope and dreams in troubled times. It is about a father accompanying his son through an experience which will change his life. But most of all it is about Colombia, the flora, the fauna, the history, the politics and, more than any of that, it is a book about people. Here’s both father and son talking about the trip. The magic couple Amadou and Mariam are one of the most loved and successful acts to come out of Africa this century, but their story is not one of overnight success. They have been singing their warm notes for more than thirty years. This autobiography traces Amadou’s early years in Mali, first accepting his blindness, then adapting, to finding a source of joy in music and playing alongside some of the country’s leading musicians. On meeting Mariam at an institute for the blind in Bamako, he discovers they share a passion for music and for life, they fall in love and begin their career as a duo in search of an international stage. Away from the Light of Day is an inspiring story which reveals the source of this golden duo’s contagious music, threading its way between tradition, religion, hope and superstition. To mark the North American publication of their autobiography Away From the Light of Day, Amadou and Maraim sit down with David Taylor and conduct an interview for Afropop Worldwide. 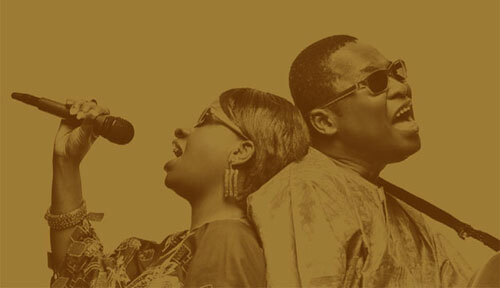 The celebrated duo of Amadou and Mariam from Mali are a one of kind musical collaboration. Not just because of their unique, style of music but also because they’re both blind. However, since forming in the 80’s, the duo have let very little get in the way of their desire to create music and bring it to the masses. Nowadays, the duo are busier than ever. Amadou and Mariam find themselves less at home in Mali than they are on the road touring. For every one month in Mali, the two are on the road for three or four months. In addition to their rigorous tour schedule, the duo have announced plans for a series of ‘concerts in darkness,’ to give audiences a different sense of how they experience music. If that wasn’t enough, they recently published a memoir of their youths, Away from the Light of Day, about how they both dealt with blindness from childhood, how they met at Bamako’s Institute for Blind Youths, and how they launched a career in music, with no griot family ties to pave the way. I started by talking about the book. Amadou: The book is for understanding our lives from when we were young, what got us interested in music, and the different phases up to now. Even if you start from a point a little out of the ordinary, when you have determination you can get to do a lot of things. People are curious about our music and it’s been well received. The book talks about how Mariam and I met at the institute and then went to Cote d’Ivoire, that Cote d’Ivoire was a platform for us, that’s where all the musicians who resisted went. The book talks of our debut in Mali, how our parents encouraged us, and how the institute of young blind people encouraged us in our marriage and way of life, and way of playing music also. The institute was where Mariam and I found each other, and began making music together. We were called Amadou and Mariam from then till now. So I think the book covers a lot of our youth. David Taylor: In the book you explain, “In Mali, we have a sort of cousinship network, called sanangougnan in Bambara, between the clans. They are constantly teasing each other, making fun, and telling funny stories about each other.” That goes back hundreds of years to King Sundiata, of the Malian Empire. Did you find that network and those friendly rivalries helped or hurt your advancement as musicians? Amadou: That history of ethnicities and clans did not especially help us, and it didn’t hurt us at all. When we are with the Peuls, we feel very good when the Peuls say jokingly, ‘Ah the little Bambara have come!’ ‘No,’ we say, ‘the little Peuls are here.’ That’s a facility, it very much is an easy sanangougnan. You can’t do anything bad, can’t put up a barrier. It obliges you to open a door to pass through. So it facilitates a lot overall. DT: In the book, the story of how your uncle pushed you to play the guitar is great. And he introduced you to Tidiani Koné of the Super Rail Band. You really didn’t play guitar before that? Amadou: So he took me to the Orchestre National, and I learned to sing there and play the guitar. DT: Were there stories after the book’s publication that you wish you’d included? Amadou: Many. The book could not tell it all because that would be too long. [laughs] So that’s the first part. Maybe there will be another part for telling the rest. Because the book goes from our childhood up to our arrival in France. But from France up to now there’s a lot of things that have happened. To read the full interview on Afropop worldwide, click here. Booktunes is a new website we feel is worthy of your attention. It is an infant idea of Erik de Loor of Amsterdam, and it makes the link between books and the music that surrounds them. It is said that 90% of success is turning up, and here’s a small anecdote to support that idea. We recently got an email from Erik at Booktunes to request a review copy of Away From the Light of Day as he felt it was something that would fit nicely on the site. We replied saying we were happy to oblige, then Erik rang through saying that he’d seen the London launch event publicised and he was going to jump on a plane or train and come over to see it. Impressed by his dedication we managed to find an interview slot for him with Amadou and Mariam. Here was a young man backing his idea own idea for a new website and on the strength of a phone call and a dedicated manner, he was slotted in between two BBC interviews and one with the Sunday Times. He was also the only interviewer of the day to get Amadou to open up on his love of the Bee Gees. Erik has recently posted the interview and a selection of 21 tunes that accompany the reading of the book. It’s a neat idea. Here’s a small extract from the interview. Follow the link below to see the whole of it and to read/download Erik’s accompanying music. Booktunes: Which songs by Amadou & Mariam would serve as a soundtrack to Away From the Light of Day? Which songs illustrate the story being told in this biography? Amadou & Mariam: ‘À chacun son problème’, ‘La Realité’ and ‘Terre La Sebin’. BT: What about songs by other artists? Amadou: ‘Staying Alive’ by the Bee Gees really inspired me, I love the way they use harmony in their songs. ‘Money’ by Pink Floyd also really helped us. And we both love Stevie Wonder’s ‘Superstition’. BT: Are there any other African artists we should listen to when trying to get deeper into your story? A: Tabu Ley Rochereau with his ‘Pitié’ and Youssou N’Dour’s ‘Immigrés’ are both favourites. BT: And what about you Mariam, in Away From the Light of Day you refer to French music. Which songs in particular? M: ‘Pendant les Vacances’ by Sheila and Nana Mouskouri’s ‘Soleil Soleil’. Ah, I shouldn’t forget Sebastian Iradier with ‘La Paloma’. A: Yeah before I started playing with Les Ambassadeurs (du Motel de Bamako) I played in a group from Koutiala called Koulistar. That was definitely my James Brown period. ‘Popcorn’. BT: Soon you will start working on the new album. Do you have plans on working with any of your favourite artists? Click here to read more of the interview on the Booktunes website and the list of accompanying tunes. Click here for more details on Away From the Light of Day. A recounting of the famous incident in which Amadou and Mariam came into contact with their now long time manager, Marc Antopine Moreu. This extract is taken from a feature in The Sunday Times written by Mark Edwards. Back in 1995, Marc Antoine Moreau, an A&R man at a French record label, was in Senegal visiting one of his artists, Ismael Lo. Deciding that he couldn’t come all the way to Africa and not see more of the continent, he took the train from Dakar to Bamako, the capital of Mali. After a few days in Mali, he was ready for the next stop on his itinerary, so, as he remembers: “I went to the bus station to take a bus to Ivory Coast. It was a small bus station, and the company I took the ticket with was just starting. They wanted to wait until the bus was full before they would go. So we had to wait three days. Moreau had little money, so he basically stayed at the bus station for three days. “One day, a little boy came to me with a big box full of tapes. I looked at one. The cover said, ‘The blind couple from Mali — Amadou & Mariam.’ I looked at the title of the first track, A chacun son problème [Everyone’s Got Their Own Problems]. I liked the title, so I played the tape. I loved it. While he was playing the tape, the woman sitting next to him on the bench said: “That’s my sister you’re listening to.” At first, Moreau assumed she meant it in the sense “We’re all brothers and sisters”, but, astonishingly, it really was Mariam’s sister. The couple were on tour in Burkina Faso, and Moreau didn’t have the money to stay and wait for their return, so he asked Mariam’s sister to pass on the message that he liked their music. Click here for the article in full. Route are delighted to announce An evening with Amadou and Mariam to launch their autobiography Away From the Light of Day. The event will include readings by Ian Clayton and a Q & A with Andy Morgan.